In a world that is becoming increasingly environmentally conscious, electric vehicles and the lithium-ion batteries that power them will play an increasingly important role in reducing carbon emissions. 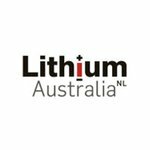 Taking the environmental theme of lithium-ion batteries a step further is Lithium Australia NL (ASX:LIT). It’s true that resource companies aren’t usually associated with positive environmental issues. However, LIT is getting ready to launch the rocket on its industry-first technology, breaking the waste cycle and creating battery products sustainably. The company is proceeding with its large scale SiLeach®pilot plant programme where it will process what would normally be considered mining waste to create premium lithium battery chemicals using world-first technologies. Just today the company announced it was preparing feed for the large-scale plant and that feed sources for the first 12 months of operation are being assessed. SiLeach® is a lithium processing technology that efficiently digests and recovers all significant metal values from the minerals treated. It can be applied to a wide range of lithium feedstock, with low energy consumption, high metal recoveries and extensive by-product credits. The company has been working harder than a Duracell battery bunny, to establish itself as a leader in lithium technology in Australia and around the world. As part of LIT’s plans to ‘close the loop’ on the energy metal cycle, LIT recently finalised the acquisition of Brisbane battery cathode developer Very Small Particle Company (VSPC). VSPC's technology base provides exposure to the most profitable process step in the battery production cycle — the manufacture of cathode powders. 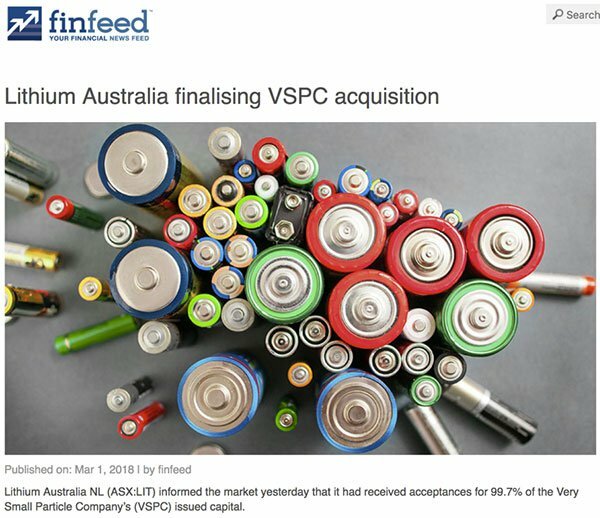 Batteries produced from VSPC cathode materials have been shown to outperform industry benchmarks. The acquisition means LIT can recover end of life batteries, recycle and re-use them through its innovative process. Although it should be noted that LIT remains a speculative stock and investors should seek professional financial advice if considering this stock for their portfolio. With the VSPC deal in the bag and its now Patent pending SiLeach® lithium processing technology, it’s no surprise that LIT is pushing ahead with its first large-scale pilot plant, which will produce 2,500 tonnes of lithium carbonate equivalent each year. LIT’s front-end engineering and design studies are nearing completion and if all goes to schedule we should see the world first come on line in 2020. 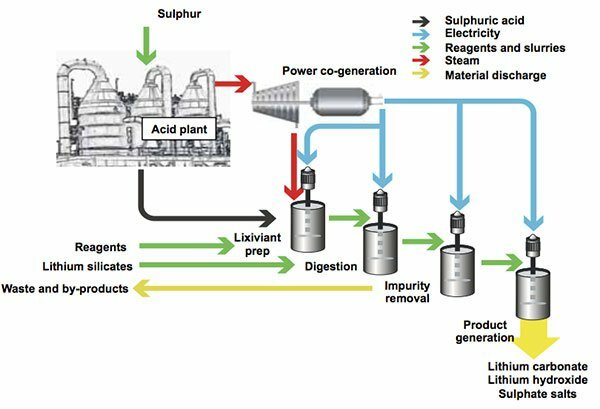 The unique pilot plant process will take waste products — namely low-grade lepidolite mica feedstock — and turn it into lithium chemicals through LIT’s SiLeach® technology. If successful, LIT could expect to have the lithium sector banging down its door as sub-economic lithium project companies rush to take advantage of its game-changing technology. In a solid endorsement for LIT and its technology, Arena Investors LP — a US-based global investment firm with A$750+ million in funds under management — has committed to invest A$18.27 million in LIT. The funding comes as a multi-tranche convertible note facility where the notes, which have a face value of A$21 million, will be issued by LIT at a 13% discount. This give LIT a real boost to its balance sheet with cash and cash equivalents in excess of A$33 million. That’s quite an arsenal, which continues to grow with investor support. With this funding package and as a first mover in the sector, LIT has access to ample supply in a fast growing market. Lithium Australia’s (ASX:LIT) SiLeach® technology is different from anything else that’s being developed. 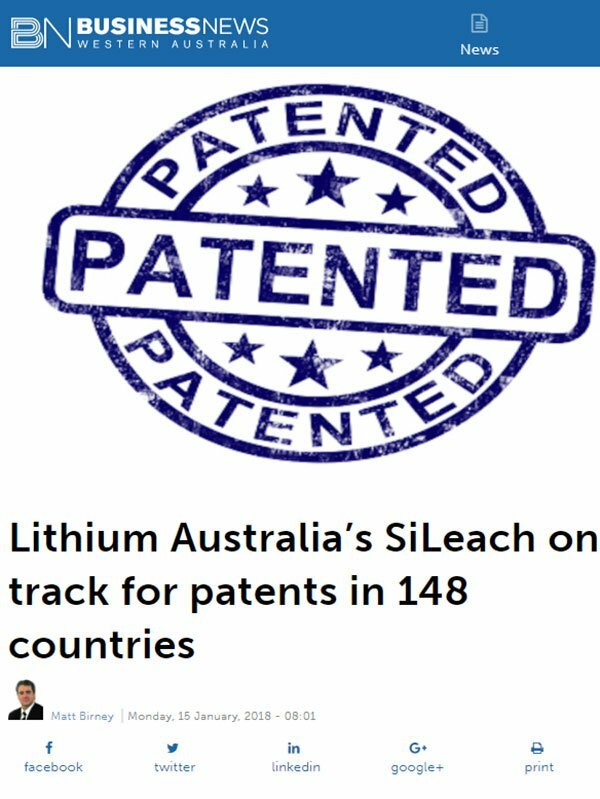 In January, LIT received acknowledgement that its SiLeach® lithium processing technology is a ‘novel, inventive, industry applicable and patentable’ process, allowing the international patent applications to proceed. The Australian Patent Office’s approval is a tick next to LIT’s name in this lengthy process to protect its technology. Adding another tick to the company’s name is the finalisation of its acquisition of VSPC, a deal that’s just a few days old. The VSPC process involves controlling the particle size and chemistry of cathode powders, meaning the exact same product is created each and every time. Essentially, this cuts production costs and because the tech is compatible with SiLeach®, potentially providing a continuous stream from SiLeach® through to cathode powder production. With LIT’s battery recycling initiative added, (Resource Conservation and Recycling – RCARC) the energy metal cycle becomes a closed loop. And that is what sustainability is all about. At the moment, there’s no other technology in the world that is ‘closing the loop’ in a vertical integration model like this. If successful, LIT’s vertical integration model will change the way lithium is processed as it draws on resources beyond primary lithium chemicals, such as carbonates and hydroxides, using an extensive range of by-products. This opens the flood gates for a greater number of resources to be plucked from an otherwise limited market. And towards the end of the cycle, rather than using a battery once, it can be used multiple times through the RCARC and VSPC processes, saving money and improving sustainability. It gives an unprecedented uplift in value beyond simple lithium production. LIT’s main goal is to apply these disruptive processing technologies to the production of lithium chemicals from mine waste, and recycling of other energy metals on a commercial scale, using the cheapest operation costs possible. With figures like this, it’s clear that cathode materials created by using lithium chemicals generated from mine waste using the SiLeach® system and then converting them to cathode powders using VSPC technology generates the highest uplift in the energy-metal cycle. Having pioneered the only technology that turns mine waste into lithium battery cathode materials, LIT has reason to feel confident about its future capabilities. However, it does still have a lot of work to do to achieve its main ambitions, so investors should still take a cautious approach to their investment decision with regard to this stock. The SiLeach® process works by digesting any silicate mineral, recovering lithium and other metals to make up the feed material. The innovative system rapidly increases the rate of lithium recovery from ore minerals and avoids using a roasting process, meaning its energy footprint remains low. Through this low-operating cost system, the SiLeach® process will create battery-grade chemicals at an output of 2,500tpa of lithium carbonate equivalent. LIT has used the phrase ‘cradle-to-cradle management’ to describe this process of re-using battery metals over and over again. And in a world where just 10% of batteries are recycled, this innovative tech couldn’t come to the market sooner. The SiLeach® process is innovative in that it takes materials others don’t want to process, such as low grade concentrates that would normally go to waste, and turns them into products. No other company has previously thought to do this, making LIT an innovator in the field. By procuring access to feed materials with low exposure to mining costs, and processing materials considered waste by other operators, LIT is on its way to commercialising the cheapest lithium battery-grade chemicals in the world. It is now assessing feed sources for the first 12 months of operation following TOMRA Sorting Solutions’ testwork on bulk samples obtained from dumps surrounding the historic mine workings at Lepidolite Hill. The ore-sorting tests indicate the possibility of rejecting a large proportion of the waste material, thereby reducing the required capacity of the ore-preparation section of the pilot plant. Once the material has undergone ore sorting, it will be assayed and mass balances calculated. Further comminution and flotation tests will also be undertaken on the beneficiated product. Subjecting rejected material from Lepidolite Hill to innovative ore-sorting technology perfectly illustrates how Lithium Australia intends to produce SiLeach® feed from mine waste. Further, similar lepidolite occurrences in Western Australia are also under investigation. LIT isn’t just processing lithium, it’s finding it. With current exploration activity hubs in Germany, Australia and Mexico, LIT is working hard to maintain equity in resource projects around the world. The company‘s 133 square kilometre exploration licence in Saxony, Germany was approved in January this year, and adds significantly to its existing farm-in/JV with Tin International at the nearby Sadisdorf tin mine. 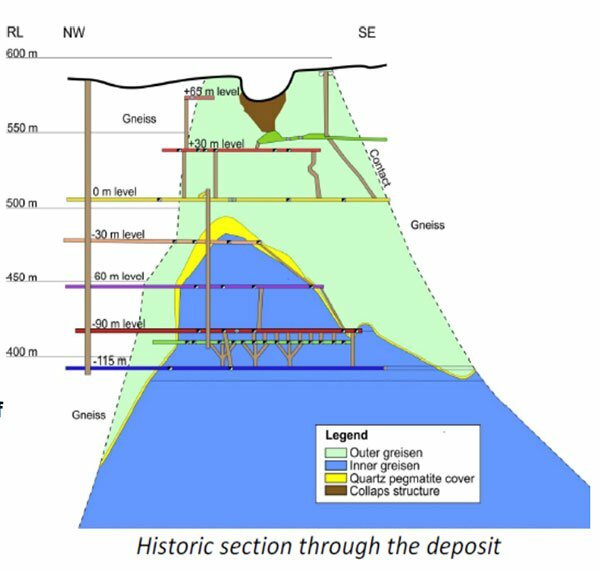 Historic drilling results at the Sadisdorf project identified potential to provide processing capacity for around 25,000tpa lithium carbonate equivalent output for ten years. Drilling continues to expand the resource base. Using the SiLeach® process, LIT could recover lithium and also by-products such as potassium, silicon, aluminium, caesium and gallium, processing these products into lithium chemicals, not to mention the tin and tungsten previously the focus of mining operations at Sadisdorf. Application of the SiLeach® will turn a moth-balled tin mine site from a resource into a reserve, breathing new life into a dormant mine. There’s no reason why this can’t be replicated all over the world at other disused mine sites. 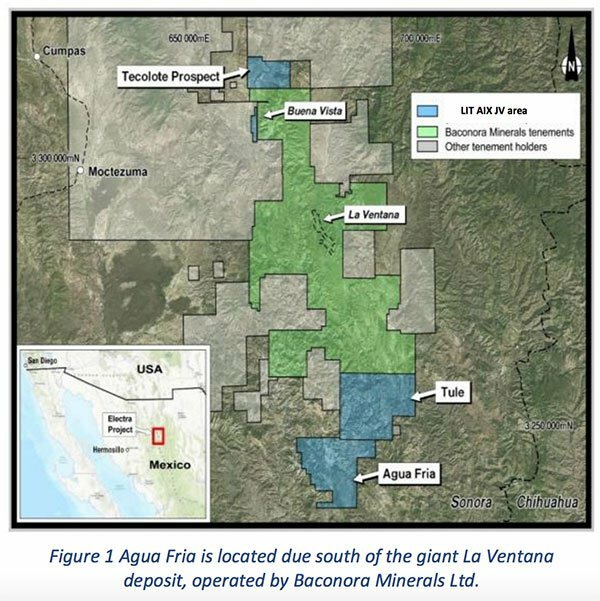 Over in Mexico, LIT is part of a joint venture with Canada’s Alix Resources, in which it owns a 54% share, to carry out tests on the potential of lithium recovery from volcanogenic sediments at the Agua Fria prospect, part of the larger Electra project, located in Sonora County. Current findings have shown acid leach at 50°C achieves 99% extraction with no roasting required. LIT continues to cement its place in the world of lithium, as a lithium chemicals producer as well as a lithium explorer. The company is on the path to change the lithium battery market as we know it. Yet this is a lofty ambition and the company is in the early stages of its attempt to do this, so investors should seek professional financial advice for more information if considering this stock for their portfolio. Keeping a toe firmly grounded in the global lithium resource market, while developing strong strategic partnerships across multiple countries, LIT is trailblazing its way to the forefront of the lithium game. What does the future hold for LIT? Power up your batteries, LIT is here for the long-haul. 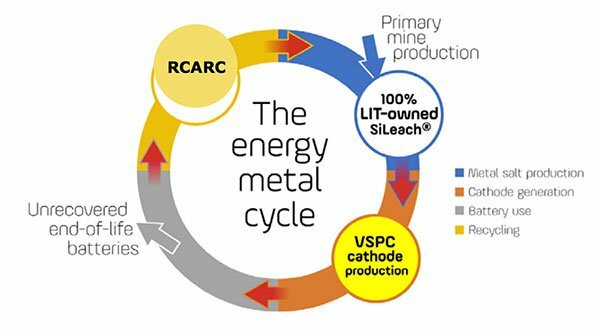 The immediate plan for LIT is to expedite the recommissioning of its battery cathode pilot plant following the VSPC deal, to produce a range advanced cathode powders (the precursors to lithium-ion battery cathodes) that can be assessed by the major battery manufacturers. The integrated technologies of LIT and VSPC will allow for better resource utilisation, reducing the quantity of valuable materials going to landfill and enabling the rebirth of many materials as new generation lithium-ion batteries. To take these next steps, LIT is busy hiring the staff it needs to get the plant up and running, while also negotiating technical service agreements to support bringing the plant online. LIT will simultaneously continue to explore lithium sites around the world, so it has byproducts to feed into the plant once it’s up and running. As the only company in the world with a full process integration of extracting metals from waste materials and creating a high quality cathode product, LIT looks to be ahead of its competition. By taking the cheapest materials and using its advanced SiLeach® technology, LIT is creating the perfect solution for a society focused on reducing waste, while filling a distinct gap in the market. For a company with immediate access to A$33 million to carry out its plans, and one that is so ahead of the lithium game, we look forward to seeing the effect on LIT’s A$68 million market cap in the months to come.